What is "Physical Computing" ? 8 plasma monitors and 14 pillars compose "Passage". Some sounds are generated and some images change when people passes this passage. 1 big windmill and 3 small windmills rotate reacting with lighting sensors. 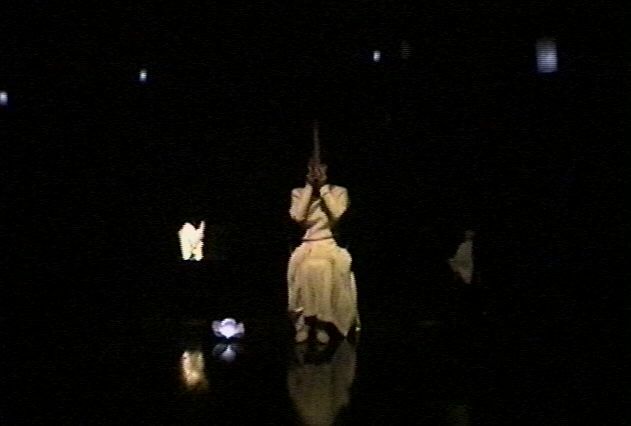 This is a live performance on the stage with the installation works. 4 plasma monitors, 2 projected "curved surface screens" and 14 pillars compose "Passage". Some sounds are generated and some images change when people passes this passage and when people touch metal objects. When people grasps or touches the "Hand" made with silicon rubber, the face in the monitor is changed, and the sound is generated. When people stands in front of the plinth, it is detected with the sensors in eight directions. Then a lot of bee on the rotating table stare at people all together. When people pulls the strings that hangs down, images and sounds that relates to "Eating" are generated. This work is composed of five boxes. There is a round eyehole in each box, and when people looks it into, "Happiness" is found respectively. Only one box appropriates the ear and hears the sound of "Happiness". 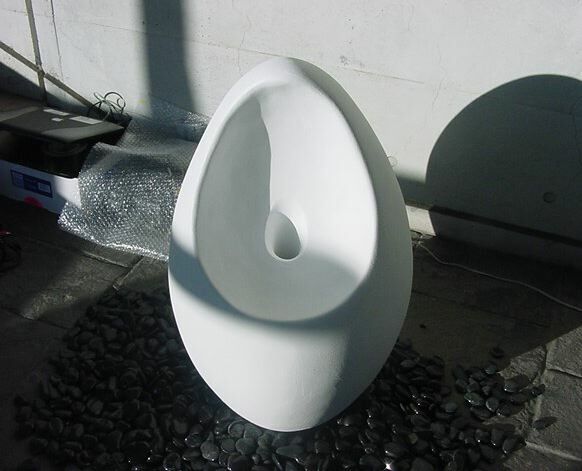 The center of the forming object (fiberglass + epoxy resin) punctures, and there are a lot of small stones in the surroundings. People can throw a small stone into this hall. Then guitar sound rings and an internal lamp shines, light leaks and goes out to the outside through forming. 64 illuminants are floating in a random place in the sky of the space like the bottom in a huge well. Each illuminant glitters and changes as lives according to the improvisational performance of SHO - instrument of traditional court music. When people looks into the peephole of the big box, 16 flash lamps emit light one after another, then "Shadowgraph" moves as animation. My appearance falls on the screen. In this screen, many notes fall on. People moves the frying-pan right and left, and obtains this note. "Good sound" rings when succeeding in obtaining the note, and "Bad sound" does to fail. Finally, the sound obtained till then rings in opposite the order when the frying-pan is upset. On the table, it is divided into 64 areas. When people puts the glass object, a different sound is generated for each place. It is a huge hourglass to which 4000 Stirorne balls fall one by one. When a small hourglass is upset by people, movie projected to the falling ball is changed. And movie projected to the balls on the floor is changed at the same time. It is a huge big snake postponed from the 4th floor to the 1st floor of the stairs. 240 LEDs are built into by this big snake. Each LED lights changing hour by hour independently. The left side of the photograph is the same size as creator herself doll. When people (right side of the photograph) pushes the foot switch putting on a helmet, he can hear of the sound from the other party. When people turns the anemometer on the wind-watching chicken,the projected image changes, and 123 blue LEDs rotate like the whirl. There is a beautiful object of the polished globe. When people touches this globe, it can be heard of the sound corresponding to touching. In the center of a huge, dark space, there is a rugged room encompassed with the cloth of three meters in length, three meters in width, and three meters in height. A different movie is projected to each the four outside walls. An innumerable box is piled up on the floor when people enters this room, and the word is written in each box. The word of the box shines when people lifts any box, it sounds in surroundings, and four movies projected to the wall change. People freely plays musical keyboard. Then, the fragment of poem is generated, arranged automatically with reading out voice, and it is displayed in the monitor. The drum rotates slowly, and animation is drawn in 350 sheets that one side is installed in here. When people throws finger to this sheets, it can enjoy animation in each place. There are 256 Jack in a spiral tower of the plastron, and this is an axis at time (timing) and an axis of the percussion instrument type. It is a drum machine of the experience type that the percussion instrument rings by the beat when people puts in the plug in an arbitrary place. There is a transparent water tank on the huge speaker illuminated from the inside. It appears as various ripples changing into the surface of the water if the deep bass begins to ring from the speaker. To resonate effectively, the tuning of the sound is designed carefully. It is a work like the pinball. The ball comes out on the stand when people pushes the button. And, a new sound rings when it hits a bell etc. on the way. People looks into the eyehole of the hut. The mouse is applied to the wall and it operates it. Sparrows of various characters are manipulated, and it enjoys a communication each other and the change in scenery. People puts 100YEN coin in the coin slot and works the dial. Then, various Movie is displayed from the inside instead of the capsule that comes out with the toy. The tree in the screen grows up fast according to the movement when moving as people stands in front of the screen. There is a wall where 100 pinwheels of Japanese style lined up in an orderly manner. When people holds up the hand in the table, the shape is recognized with the camera. The wind occurs only in the place of the pinwheel corresponding to the pixel of the shadow, and each pinwheel rotates. There are four books on the table. Three corresponds to three stories. The Movie of each theme is screened when people opens the book, and it stops if it shuts a book. The continuation of Movie is screened if it opens again. There is the fourth book that resets the whole, too. Music is played beating the metal pipe arranged in surroundings one after another when the train model that installs the electrode in the rail runs. The speed and the direction of the train model change depending on the remote control operation of people or the sound of the hall (volume). People plays the harp without strings. The sound and graphics are generated with the optical beam sensor. 13 "nonvisible strings" corresponds to the music scale in the vertical direction. Three "nonvisible strings" in horizontal direction change octaves. Optics USB mouse is remodeled to a huge size that man can get on. People can draw the picture by hips by riding on this mouse. It is cubic object that welds the metal, and there are 64 switches per each six side. Six respects correspond to six kinds of musical instruments of Drum, Bass, Guitar, Synth, Piano, and SE. Creator composed 384 short loop music as a whole. People can enjoy session by pushing an arbitrary button. It is display object with eight screens. A round displays a consecutive image each frame synchronously by eight PC with which the network is connected. Microphone has adhered to a movable pipe of the stand. When people speaks, the image that reacted to the voice can be described on the screen in the part where the pipe was turned. "The Real Phantom" is media installation work with the first device in the world. The device - Transmissive Mirror Device with Micro Dihedral Corner Reflector Array - is a passive mirror forming a real image. The disk that queues up form of 16 pieces to reversing of the ruggedness rotates when people turn a handle. It is compared when forming comes right under the device with the flash that emits light synchronizing with the rotation, and the animation of Zortororp is achieved. Forming work with four buttons. 168 LED in total draws the pattern of light of each various patterns to which the button is pushed in a translucent acrylic fiber. The microscope image corresponding to the screen appears when choosing the device like the microscope from two or more Praparats and setting it. The stand of the Praparat is good up and down and right and left at the slide by about 5cm by the hand. The living thing in the screen moves with the movement of view according to this, and the sound from the headphone moves, too.. This is a structure like chair to which people can sit surrounds hole at center. The part of the hole at the center is a screen, and the image that changes hour by hour at the four seasons comes out. When people touches the part on the edge in surroundings of the hole, the images change. Sound installation of forming eight square pillars with round display in center. 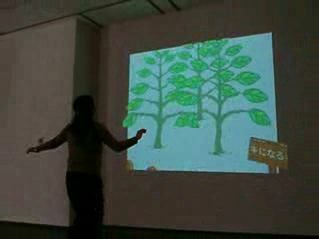 The display is a touch panel, and people can enjoy the image and the sound that changes variously with touching. Six knobs hang with the chain in front of the screen. The paint of light drips, drops in the screen when people pulls the chain, and various light mixes. One is "The color is erased" straightening. This is an installation work that draws the picture on the screen and generates the sound. Creator performs as live performance. On the other side of the screen, there is an illuminant of infrared rays LED following with the magnet, and it draws in this while following by the image recognition of the video camera on the other side of the screen. The controls such as a color, patterns, and color changes are done with the controller and the glove of original production. This is the first work using Processing in SUAC students. There are many small living objects in the screen, and they go away from human shadow(edge). Each small living object has its algorithm moving with random and go away each other. If they are inside the human shadow, they cannot cross the edge, so they move only inside of human shadow. This is a simple/old block game with moving ball and racket, but the racket is controlled with big object which is moved by human. The position of the object is captured by web-camera and motion capture tool for Flash. This is the first installation work using RFID. People select the card and set it onto the card holder which contains RFID reader. Then, people open/change pages of the "White Book", the page information is detected by magnetic sensors, and movie on the screen is changed. This is an installation work produced for SUAC 12-CRTs monitor panels. This system has 12 Propellers which generates real-time graphics and generates real-time NTSC video signal only by software. The 13th Propeller receive MIDI sensor(foot switch) information and change graphic patterns in real-time. 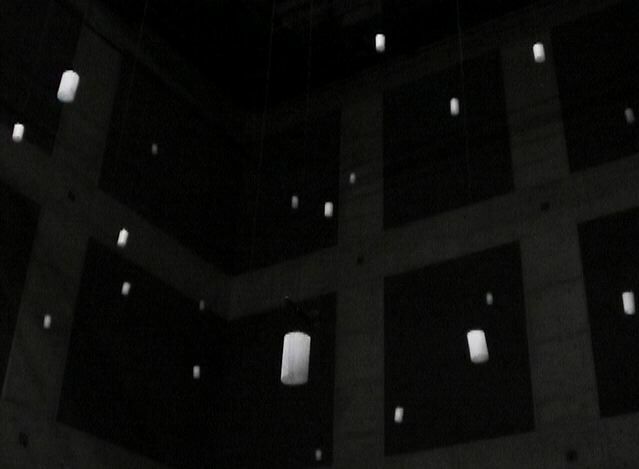 This installation work is designed for special "meditation" hall in SUAC. There is a small space constructed pipe-form cloths, and people go in and lie inside. In the above space there are some hundreds of LEDs shining slowly. This installation work is for not only watching/touching screen but also feeling reaction of electronic pulses. In the screen there appear some traditional ghosts in Japan, and people touch them with the touch-panel on the monitor. When touched, they are moving/lighting, and specially generated high-voltage electronic pulses hit the people's finger. This installation work is one kind of table with screen panel on the upper side. There are some cups on the table, and many moving images run around cups. When people take out one cup, the image around the cup will disappear. Camera detects the special image patterns pasted on the bottom of cups. In the dark hall, a doll of pretty girl sits on the wall. Both eyes of the doll are missing. There is also a mirror on the wall. When people stands near of the doll, the mirror changes into screen which shows people himself/herself with the view from one eye-hole of the doll (inside CCD camera). There are some eye-balls in front of the wall, and when people pick up them, the screen image changes. This is a simple/old block game with moving ball and racket, but the racket is controlled with big object which is moved by human. The position of the object is captured by web-camera and motion capture tool for Flash. This revised version has 3 musical modes in the game. There is the "shari" (rice base) on the "geta" (sushi table). There are 15 "neta" goods (fishes, shrimp, etc..) on the table, so people can pick up each of them, and put it on the "shari" to complete the "Sushi". Each "neta" contains RFID inside, and the "shari" has RFID reader in it. Then, special movie of each "neta" starts in the screen. There are 4 small panels (painted on upper side - seed, small leaf, frog, and tree) on the table. People pick up and put them on the table. On the screen, there starts the special tale movie related with the sequence of these 4 panels. This installation work is a game for 4 people. Each people use Mouse with specially designed "4 Mouse interface". 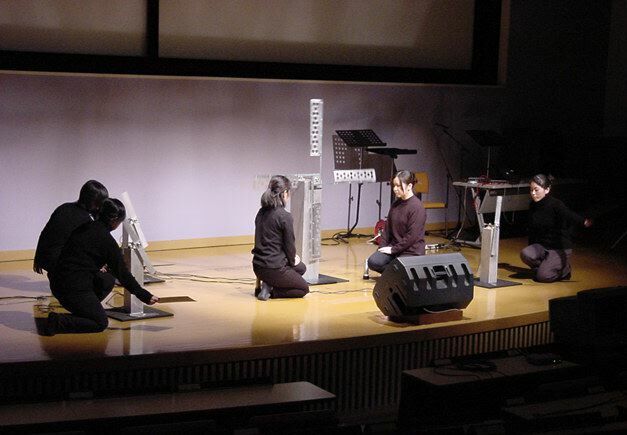 In the screen, the icon of musical note appears, so people move their character to catch it. This installation work is a big wall containing many rotating objects. This work is the expansion of previous work "Nejimaki Ningen" created by Aya Suzuki, and rotating objects and still objects on the wall is re-used from the previous work. Moving pattern is time-variant, and the video work of Aya Suzuki which is in same concept is projected on the wall. The concept of this installation work is Japanese slight vibration on the water. Japanese traditional SHOJI screen is set for projected images. The projection is not directly projected but reflected by water. The water is vibrated with low frequency sound. There are 5 to 10 small human dolls. When people put them closer, so orange light brights inside dolls. One object is set on the tree. The object make light from inside of it, and the light changes its brightness slowly. When sound is detected (people cry, hand clap, whistle, etc), it turns dark quickly, and it begins making brights again after some moments. There is a "heart" object made of rubber in the human body object. People touch the stethoscope onto his/her heart. The system detect the heart beats, and the rubber "heart" object moves bigger/smaller synchronizing the human heart beat. There is a screen-table which is projected images from the ceiling. When people changes the page the book on the table, the projected image changes to metamorphose the icons of the page. There is the Futon (Japanese blanket) on the stand and it is screen. When people beats the Futon, then images/movies of memories appear on the Futon. This installation work is a combination of 3 items. The first is a cute desk in girl's room. The second is a special funny-decorated monitor. The third is a original Flash game. The concept is "my favorite space". This is a installation work which concept is "space-channel program" monitor. People picks up the old-fashioned receiver, and dials the old-fashioned telephone dial. Then, the monitor starts showing the movie. This installation work is based on the original tale written by the creator. The three color-making men walk in the world, and they pick up many colors and they fill these colors everywhere. People can use special sensor which detect the color information on the top edge. People touches any points in the pictures, then the white flower objects changes the color into which is detected by the sensor. People can walk around on the big world map. When people step on some points, the movie related to the area in the world are projected on the wall screen. 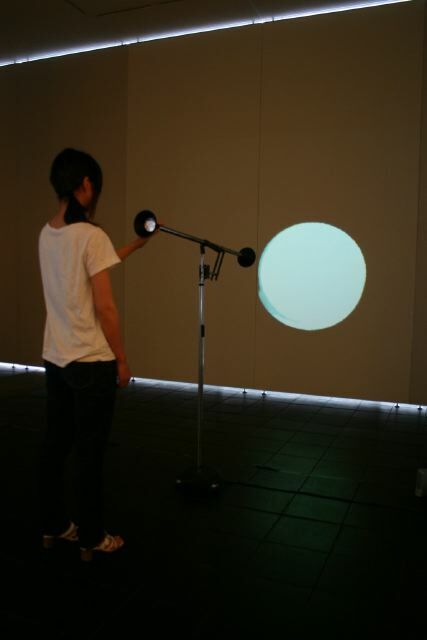 This installation work is constructed with a big ball (about 1 meter) which is the screen like the earth and the controller. The earth is projected onto the ball. When people rotates the ball, the jewels information of the highlighted area is displayed on the screen. This installation work is an expansion of the work "OTOkakecco" with 4 Muose. 3 people wear 3 color hats - red, green and blue. The web-camera detects the points of each player, then they play the game. This is related "goldfish hunting" game, with a technology of image capturing. But people cannot hunt goldfish. People is the goldfish who must run away from the nets for capture. This installation work is constructed by metals. When people throw a small metal ball, the the ball goes around on the rail. When the ball goes behind the monitor, the ball goes very slowly in the monitor, then the ball appears again from the monitor. There are 2 dolls of lovers. People pick up one of objects from the table and put it onto their hands. Then, common story is displayed in the center screen, and next the "real voice" (secret) movie is displayed in each stomach part of dolls. People enjoy the difference of their "real voices". The title of this work is a parody of ASICS". There are many playing games of Flash using motion capture technology. 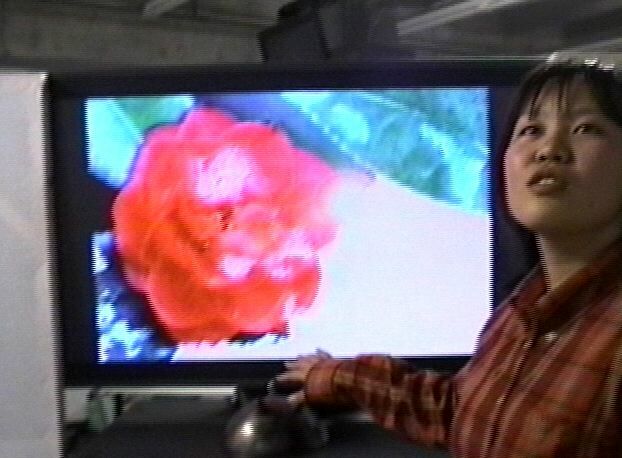 This sound installation work is the strange flower that eats sounds and vomits arranged sounds. People move the turntable and say/sing something into the flower. Then, when people move the turntable again, processed sound is vomitted from the flower. This installation work is a prototype of AED. People push start button of the machine, and follow the instruction from it. The voice instruction is just same of real AED. People take off the cloth from the body doll, and then put on the electric contact pads on the correct positions of the doll. After that, people push "GO !" button. If the position of pads is OK, then the system says "OK". This installation can be used how to learn AED. The title of work HOUJU means "jewels tree". People touch the shadow of the tree, then many bright patterns appear inside of the shadow of the tree. This installation work is a house made of cookies, chocolates, candies, etc. People pick up one of gifts from the table, and put it into the chimney. Then, related story movie starts in the window monitor of the house. After that, the gift is automatically moved out from the house, then another gift can be put in. The title HikaBeko means lighting cowfish. This object is made of soft jerry material. This object generates slow changing lights from inside. There are four horns on it, and when people touch it, then fast flashing light appear from inside.